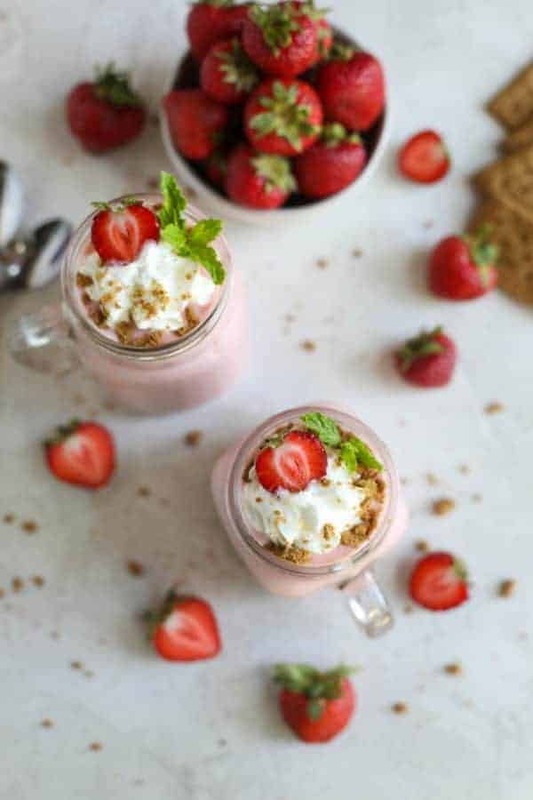 Shake, shake, shake up your breakfast routine with this Strawberry Cheesecake Smoothie! This post was created in partnership with our friends at Organic Valley. Go ahead, have dessert for breakfast. No really, go ahead. 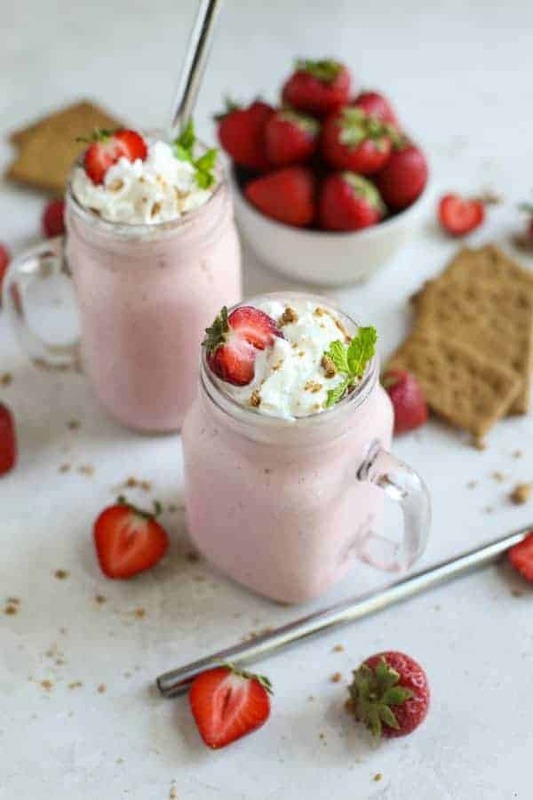 It’s okay when it’s a Strawberry Cheesecake Smoothie packed with protein, calcium and just enough sweetness to make you feel like you’re breaking all the healthy eating rules (even though you’re not). True story, my kids will only eat ONE kind of smoothie. Vanilla yogurt + Banana + Peanut Butter + Chocolate chips (it’s just a few mini ones, don’t judge). They call it a ‘Monkey Smoothie’ and no lie, it’s the only smoothie I’ve made for them in the past four years. Until this week. And don’t think I haven’t tried to convince them to try other kinds of smoothies. 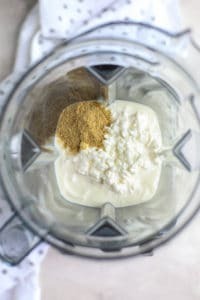 I’ve whipped up countless concoctions over the years and each time it’s been something like this: “Too green/too sour/too chalky/too _____.” I’ve even gone so far as to haul the Vitamix downstairs to the furnace room so I could blend in spinach and other veggies without them knowing all to no avail. 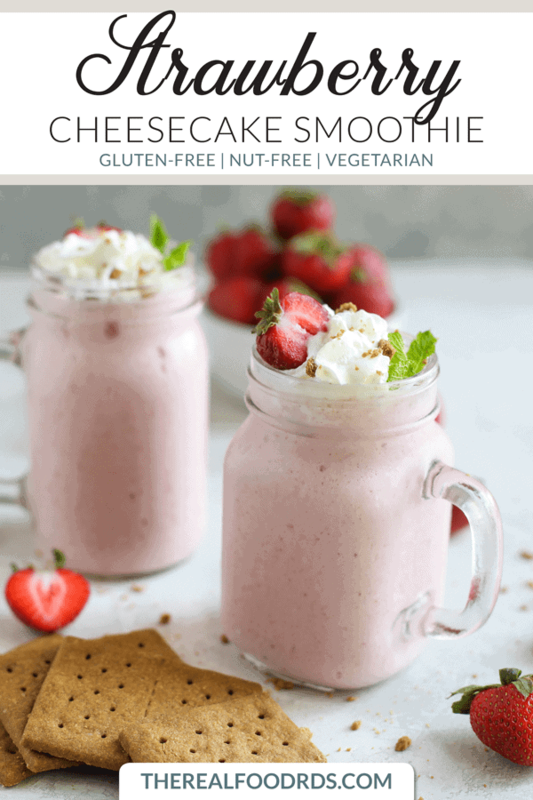 I’d pretty much given up and resigned to a life of making ‘Monkey Smoothies’ several times a week until I send them off to college in about a decade, but then this Strawberry Cheesecake Smoothie happened. And everything changed. They sucked it right down. Of course, it didn’t hurt that I’d fancied it up with whipped cream but there were ZERO complaints. Now, keep in mind I didn’t add spinach to this (though I desperately wanted to) but nonetheless, it was a victory in my book. And I’m pretty sure you’ll think the same – even if you’re not trying to win over two overly critical foodie kids. 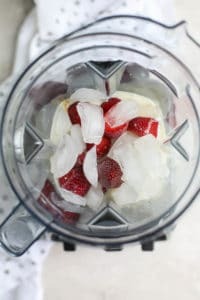 This smoothie has it all – sweet, summery berries, a hint of vanilla, protein and the perfect amount of tang just like a good cheesecake should have. Plus it packs an extra nutritious punch thanks to the Organic Valley Grassmilk Yogurt inside. And the taste? Grassmilk tastes the way milk should taste. 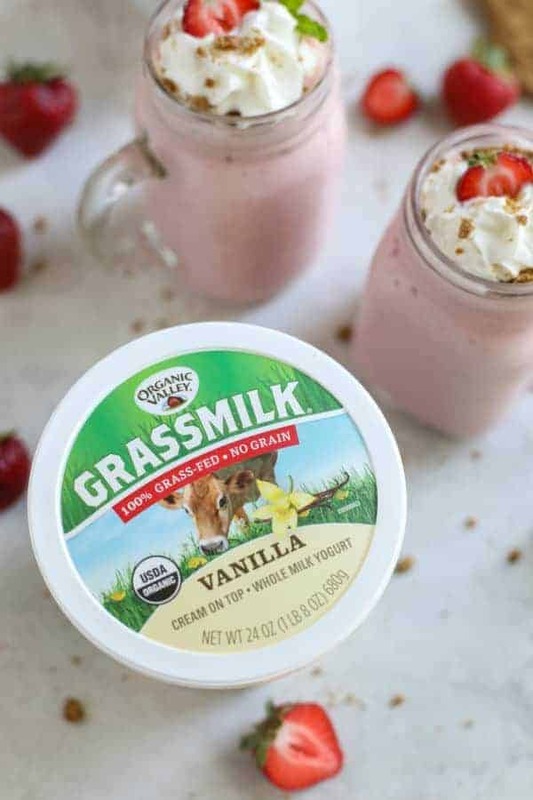 Rich and creamy with subtle flavor notes that change with the seasons and with the type of pasture the cows graze. And every tub and cup of Organic Valley Grassmilk Yogurt comes with a luscious layer of cream on top. Even though we’re lucky enough to have access to raw milk through a ‘herdshare’ here in Colorado, as a busy working mom I just don’t have time to make yogurt and cheese from the milk. 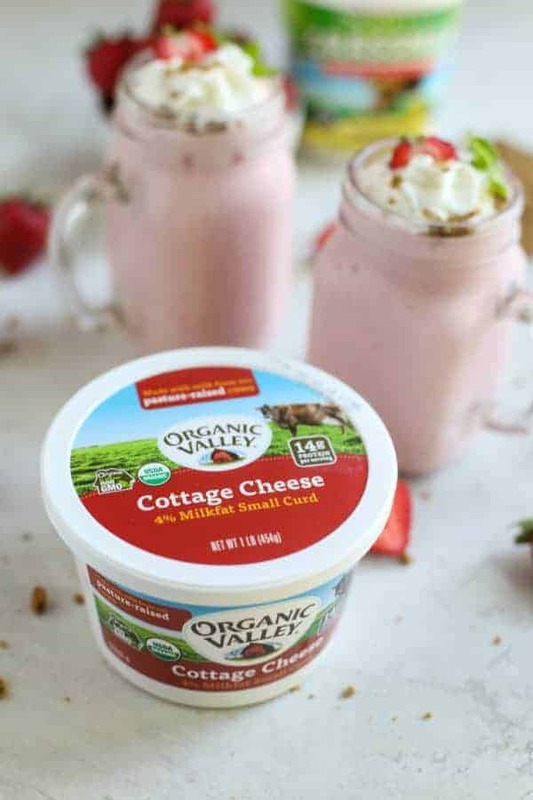 And let’s be honest, my kids PREFER the Organic Grassmilk Yogurt over my extra-tangy homemade version and they love that it comes in 6-ounce cups for lunches and road trips. I love that I can offer my family the same delicious (and nutrient-dense) options without all the fuss. To find Organic Valley Grassmilk Yogurt in a store near you use their product locator here. 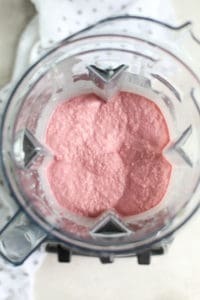 Protein powders are a great way to add satisfying, muscle-building protein to a smoothie, but if you play your ingredient cards right you can pack your smoothie with plenty of protein without a single scoop of powder. How, you ask? 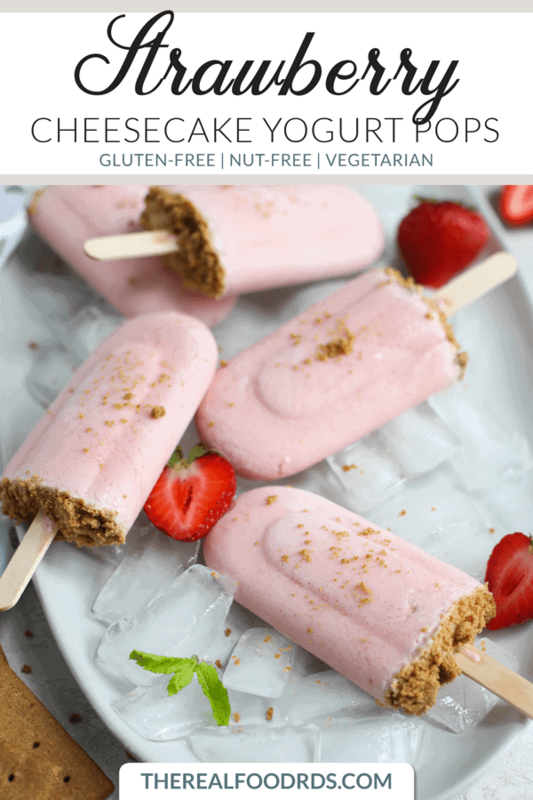 With cottage cheese! 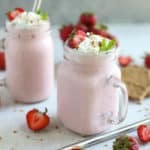 Not only does it bump up the protein in the Strawberry Cheesecake Smoothie, but it also gives it a rich, silky texture. 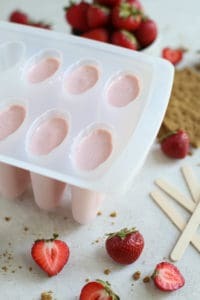 Somewhere around the 874th time that I had to prepare a ‘Monkey Smoothie,’ I wised up and started freezing the leftover smoothie into freezer pops. This meant that I could take a day off from the smoothie making (read: drink my coffee while it was still hot) and just hand the girls a pop or two and let them have at it. 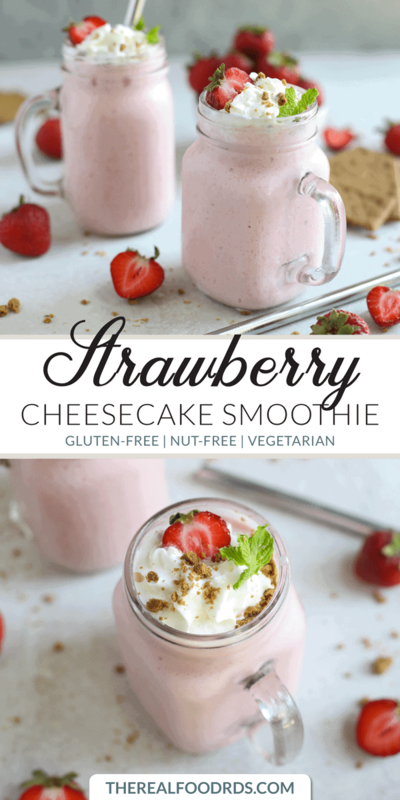 Which is exactly what you should do with this Strawberry Cheesecake Smoothie, too. 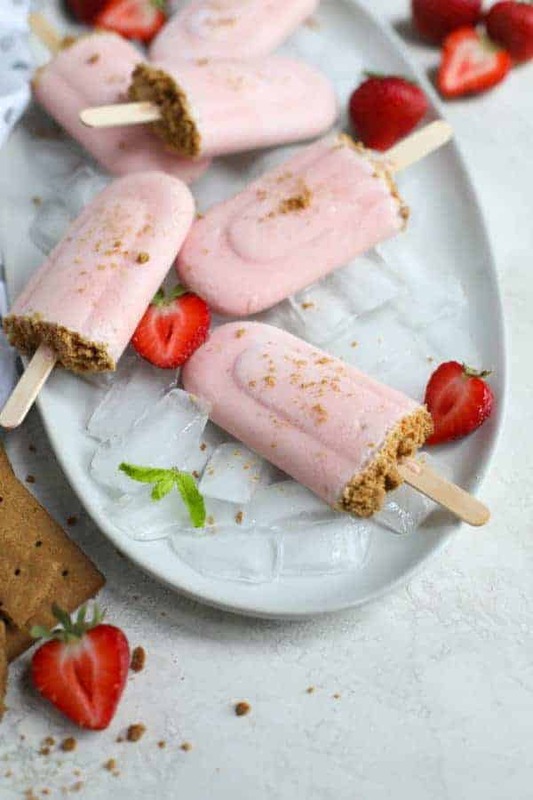 Maybe even double the recipe and make a few extra for afternoon snacks or a healthy, low-stress dessert on a hot summer evening. 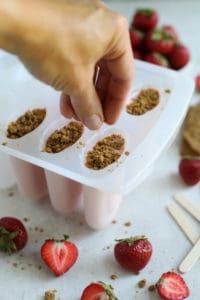 Just pour the smoothie into the wells of your freezer pop molds (I use this one), sprinkle with graham cracker crumbs, add the lid, insert the sticks and freeze until solid. Store pops in a plastic zip-top bag in the freezer. 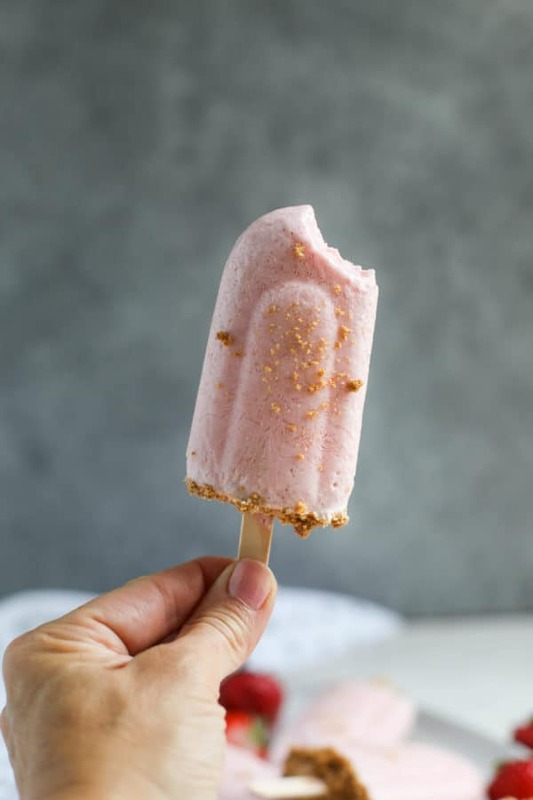 For best taste and texture, remove pops 10 minutes prior to serving or just go sit outside on the steps or in your hammock on a hot summer night and let the warm breeze soften the pop for you. What is CLA? (n.d.). Retrieved from http://organicvalley.custhelp.com/app/answers/detail/a_id/3/~/what-is-cla? 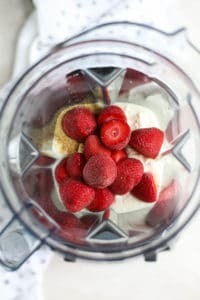 Add yogurt, cottage cheese, strawberries, milk, flax meal and ice to a high-power blender. Blend until smooth. 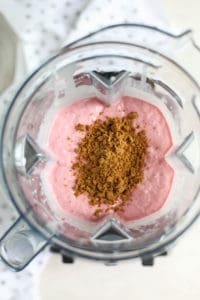 Stir graham cracker crumbs into smoothie, reserving a pinch of two to sprinkle on top. 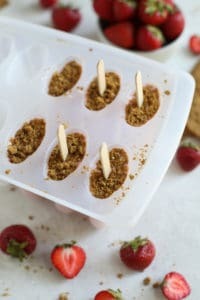 Pour into glasses, top with whipped cream, if desired and remaining graham cracker crumbs. To whip cream: Place ¼ cup heavy whipping cream in a small bowl. Whip with a hand mixer or by hand using a whisk until stiff peaks form. What’s your favorite smoothie combo and do you also have to sneak in veggies, protein, etc. without anyone seeing?! Tell us about it in the comments below. This post was made possible by our friends at Organic Valley. Though we received compensation for this post, the opinions expressed here are – as always -100% our own. Thank you for supporting the great companies we work with thereby allowing us to continue creating great recipes and content for you. Do you list the nutritional values anywhere? The nutritional information is at the bottom of the recipe card. Hello, iam confused, Organic Valley’s yogurts are pasteurized. So all the nutrients are killed when pasteurized right? That’s why the FDA approved adding synthetic vitamin D fo milk because pasteurization kills everything. So why would I pay $16.99 for their grass fed milk or yogurt when its pasteurized? Thanks for any info you can help me with. Great question. Organic Valley does pasteurize all of their dairy products because they are required to do so by law. Pasteurization is designed to kill off harmful bacteria and extend shelf life (so the products can shipped). Though pasteurized milk does not have as many active enzymes as does raw milk, it is not nutritionally devoid. The pasteurization process does not alter the conjugated linoleic acid (CLA) content or change the ratio of omega-6 to omega-3 fatty acids. Cow milk is not a naturally occurring source of vitamin D. The addition of synthetic vitamin D to milk in the U.S. was a public health initiative that began in the early 20th century as means of preventing rickets. This looks & sounds amazing. I do not tolerate diary but I will definately do it for my husband, as we are doing the 21 Day No Sugar challenge 🙂 So he will be thrilled to get smth yummy without added sugar -> will just have to make sure the yoghurts are totally guilt free! Hope your husband enjoys this recipe as much as we do!